On Wednesday the new p2p lending marketplace Squirrl.com launched. For an introduction on the concept read the article ‘Squirrl Launch – Secured Loans to Suppliers‘. 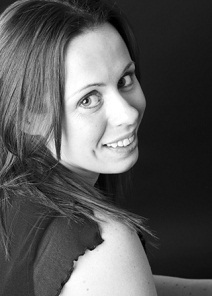 Now Sophie Coles, Squirrl’s Director of Business Development answers my questions. 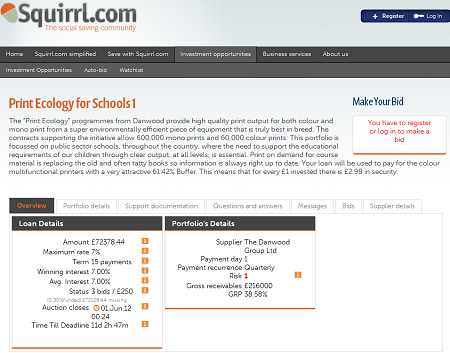 Squirrl.com provides an online finance platform for well established commercial organisations (Suppliers) that have a business model where assets are provided to their customers and paid for over a period of time through Pay for Use Agreements. Examples are the motor industry, industrial machinery, office equipment etc…. If this type of organisation has no other financial arrangements it must pay for the assets at the start of the contract, and only receive its money back over the life of the agreement. Few commercial organisations can suffer the impact of this negative cash flow, yet customer demand for this service model is growing. Investors using the Squirrl.com platform can lend money to this type of Supplier in return for higher interest rates than they would get from the high street banks and have their loans secured. How did you get the idea for Squirrl? Since the banking crisis of 2007/2008 the flow of money available to commercial organisations to finance Pay For Use Agreements has almost dried up yet there is a huge demand from all sectors for such contracts. Traditional funders have become increasingly inward looking and preservation of their balance sheets their primary concern. There had to be another way to fund these contracts that are often underwritten by high quality customers and supported by highly reputable Suppliers. If someone was prepared to lend to another person on an unsecured basis as demonstrated by the P2P marketplace then surely that same person would lend to a good quality business secured against the cash flow of the Pay For Use Agreements. That was the trigger moment that occurred in 2011 and for the last year the site has been under development. Squirrl savers can achieve higher interest rates than saving through high street banks typically between 5-15%. Loans are made to established commercial organisations and then secured against the cash flow from a pool of a minimum of at least 20 Pay For Use Agreements. There is always a substantial buffer built into the security so that on average there is £2 of cash flow available to repay £1 of loan. A 13 point risk mitigation programme is designed to reduce risk to the investor as much as possible. Typically the interest rate savers receive will reflect the level of risk associated with the investment opportunity. Initially Squirrl.com will only accept the lowest risk organisations so interest rates will vary between 5-7%, which is still a great return compared to what the high street banks are currently offering. Which marketing measures do you plan to attract lenders? Initially we are planning a very soft launch for Squirrl.com and will not be over promoting the concept. Savers do not have to pay any fees to join and start bidding apart from a one off £5 fee to cover the costs of user identification to comply with Squirrl.com security and Money Laundering Regulations. We want to stick closely to the community feel of social saving so we want to make the user experience as good as possible and Squirrl.com will continue to evolve through user feedback. After the initial launch we will start to seek other suppliers who could benefit from gaining finance using Squirrl.com, but we will only work with reputable companies who have high quality, structured Pay for Use Agreements in place. We can also act on a consultancy basis to help companies develop their structure to meet our criteria. Ultimately we want Squirrl.com to represent high quality, low risk, high return saving for the community so finding suitable suppliers to fit the bill will be crucial in maintaining this quality and reassurance to our squirrl savers. What was the greatest challenge so far in the course of getting Squirrl ready for launch? The concept of social saving and peer to peer lending is fairly well accepted now but Squirrl.com is different to any model currently out there, so the hardest part was trying to explain our model in ways that anyone could understand. We had some great feedback from our testing group and this has led to two distinct sides of Squirrl.com. On the website users can find a simplified version and also a more detailed financial version. We want to appeal to both serious experienced investors as well as first time investors. Squirrl.com is a social savings site for everyone. Do you see the fact that Squirrl was founded from the background of a long time established company as a competitive advantage over other concepts in p2p lending? Having Danwood as our launch partner and Supplier is a fantastic opportunity for everyone involved. Having been established for 40 years and having a superb reputation in their marketplace this should give savers peace of mind about the quality of suppliers who will be using Squirrl.com for finance. Alongside this Danwood have a huge volume of sales in the public sector so we have some great initial investment opportunities on the website including contracts with the police, schools and even the royal household! Where do you see Squirrl in 3 years? Is P2C Lending a threat to banks/leasing? Squirrl will continue to develop in the niche market it has established so fundamentally it is lending to established business and using Pay for Use Agreements to provide security. The next major step will be to extend the product offering into an FSA approved version that will be subject to “collective investment rules” but this will offer the chance to create some very exciting returns for investors and Squirrl believe enable them to break into the more conservative saver market. FSA approval is a key issue that is not possible with traditional structures and Squirrl is no exception. In broad terms we see two quite distinct sides to the market. The first is developed through traditional social banking P2P or P2B concepts. We believe this market will continue to grow but will be subject to constraints and the first doggy deals and opportunistic companies to enter the market will taint it. Whether this is simply a market growing up and maturing and its impact on potential savers appetite is difficult to say but quite clearly Gartner’s estimate of a 3 GBP billion marketplace by 2013 is unlikely to happen. The second is through lenders to whom social saving is currently unknown. One of our user tests indicated that 98% of people we questioned had never heard of social banking or names like Funding Circle and Zopa. That was a staggering statistic as all people questioned were of working age and in employment. The percentages of disposable income saved will continue to rise from its current rate of 13.1% to over 16.6% by the middle of this decade. That compares to Germany at 22.6% and the eurozone average at 20.9%. That means that there will be a 27% increase in saving in the UK and the question is where will the money go? The young computer user who is prepared to save on line is fine but the statistics tell us that 80% of Britain’s 6.7 GBP trillion personal wealth is owned by people aged over 50. Getting to these people and convincing them to invest in P2(PC or B) is going to be tough. They are conservative by nature a fact that is indisputable as the runway ahead becomes even shorter. Balancing risk and reward is far more important to someone in their later years than to a younger investor so we may all hate the banks but if the bank goes bust there is the Financial Services Compensation scheme to ensure a soft landing, at least to a level. For these reasons alone Squirrl has a reasonably conservative view as to value opportunity in the market and would consider a yearly run rate of £30m within 3 years as being a success. Given that this figure would represent less than 0.033% of leasing business transacted in the UK last year then one can see that the figures are minute in comparison. P2P-Banking.com thanks Sophie Coles for the interview.